For those who have no idea what this poll is about, please read this post from last May. This post from June has more information about the poll. As you can see, there were only seven votes. Thank you to everyone suggested names and who took the time to vote. This is a bit more than the other polls I've placed on Homer's Travels but it's still pretty pathetic. 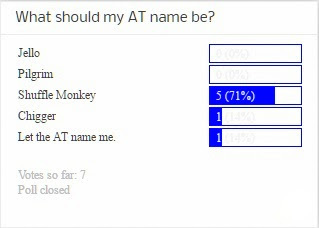 As you can also see, the seventy-one percent of the people who took the time to vote picked Shuffle Monkey. What an unpredictable outcome ... sigh. For those who wonder about the origin of the name, read this comment left by our awesome family friend, GoatGirl. I will seriously consider the results. Who knows, when someone asks me on the Appalachian Trail what my trail name is, I am sure ... for a split second at least ... I will consider saying my name is Shuffle Monkey. At the very least it will bring a smile to some of the tired faces I will encounter along the trail. Book: Sylvain Neuvel's "Sleeping Giants"